Christmas weekend, no less than New Year's Day next week, is a civil hoiday. Sure the celebration of the nativity is the "taking-off" point of Christianity as one of the world's great religions. And the birth of the "Prince of Peace" points to this season as a time to celebrate the prospect of peace and hope. But in the USA Christmas is regarded as a national event, when the post office and banks are closed and members of the workforce - regardless of religion, are routinely granted time off to be with their families and friends.With that in mind I'd like to wish everyone "season's greetings"! I hope you use this week and next for moments of greater relaxation and reflection, while contemplating what you accomplished this past year and what you hope to achieve in 2011. 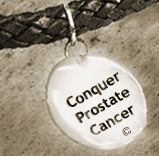 Take this opportunity to recognize how far you've come in your prostate cancer journey, while pinpointing where you still have to go. Whatever your previous accomplishments, resolve to make more of the new year than the year gone by. At this transitional season I'd like to thank you for taking the time to join me in exploring the broad range of issues related to prostate cancer. I also look forward to our renewed efforts to delve further into this realm. As in the past you can count on me to help you meet your goals for the new year. This can and will happen, as long as we resolve to keep working together.